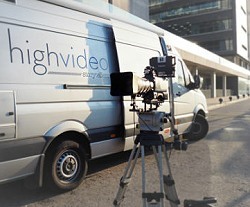 Highvideo in Barcelona offers OB broadcast services. Barcelona, August 2018: Highvideo Storytellers prides itself on the art of storytelling by using its skills in the audiovisual media. It's equipped itself with all the necessary technical facilities in order to cover a range of events, whether they be sports, news or corporate occasions. Included in its facilities is a Mercedes Sprinter OB van which has up to six HD cameras and four in 4K. In addition to offering live transmissions, the Barcelona-heaquartered company - which is new to promoting its broadcast services on TVZ - can also supply post-production and ENG camera crew services.